If you follow our mechanic on Instagram you might noticed the hashtag #ARKSVitusProject he started a while back. 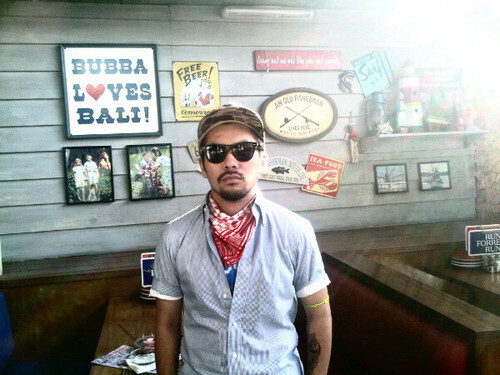 Rudy "Macan" Cahyadi is a household name when it comes to urban street art scene, under the ARKS or ANSWER4 moniker. A warmhearted person with full-of-life personality, he passed away suddenly earlier this year. Macan was a keen cyclist. We remember how excited he's always been when he got a nice vintage Vitus frame and how he really want us to build it. At first the frame was taken care by 360 Bike Co., but then they decided to let us build it. To let us fulfill our promise. The frame is a 48cm Vitus 787. Gunawan Budi Susilo, our friend from 360 wanted to build this frame as a townie for his girlfriend. We decided to retain everything on the frame as original as possible, and that includes the frame's raw aluminium finish. Apparently this frame was never been built before, or even left the factory warehouse... everything was fresh, even we can still find some production notes written with markeron the bottom of the never-been-threaded bottom bracket shell. Other than the wishbone seatstay, some of the distinctive features on the 787 are the seatcluster and ingenious rear brake cable routing. The seatpost bolt is missing so we have to fabricate them. Everything about this build feels just like jigsaw puzzle falling into place. The frame came without fork, so Gunawan decided to use steel unicrown fork that matches the wishbone seatstay. When it comes to the decision of what parts this bike should have, a good friend sold us a near-complete Shimano 1055 groupset for a bargain price. We also have a few friends donated some of the parts such as pedals and saddle. The Araya AR-317 rims was polished to match the raw finish on the frame. Since blue was Macan's colour, we decided to incorporate some anodized blue touches. The stock gearing on the Shimano 1055 7-speed cassette was too tall for urban use, so we decided to create custom cassette cluster on it. What was 13-14-15-16-17-19-21T is now 13-14-15-17-20-23-26T. The cockpit consist of polished Sakae Custom stem taken off a Bridgestone (along with the stem-mounted bell), Velo Orange Belleville handlebar and Dia Compe brake levers. The result is clean, classic-looking townie that we're sure Macan would've approve of. Rest in peace, buddy. We surely miss you.